Scientists investigate the genome of a tiny skeleton named "Ata" found in the Chilean desert and thought by some to have an extraterrestrial origin. 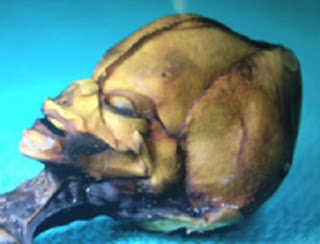 When you look at "Ata," you can understand why some UFO fans think the tiny skeleton comes from another planet. seen in popular depictions of aliens. But Ata isn't an alien. She's human, and a team of researchers are learning more about her genetic secrets. "'Informed Sources' are saying that Greer's Dead E.T. is Actually an Immature Spider Monkey"